Peanut Butter Brickle likes his soup. He likes it refreshingly chilled on a summer day, but also likes it a little warm (not hot) on a winter day. For his dinner party, he prefers to have it chilled with a dollop of Mountain High Yoghurt and a sprig of fresh parsley. For the persons, follow the recipe below, but add salt to taste. Make room at the table Peanut Butter Brickle. This recipe is both dog and person friendly. Delish! Heat oil in a medium saucepan over medium heat. Add chopped carrots and saute 5 minutes. Add chicken broth and bring to a boil. 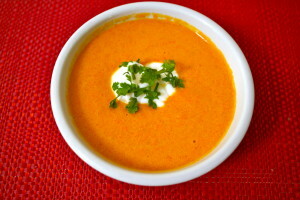 Cover, reduce heat to a simmer and cook 25 minutes or until the carrots are tender. Add ginger, cover and remove from heat. Let stand 5 minutes. Pour carrot mixture in a blender, add yoghurt. Blend 5 minutes or until smooth. Return pureed soup to pan and warm over medium heat for 5 minutes. Let cool. Serve with a dollop of yoghurt and parsley sprig on top.